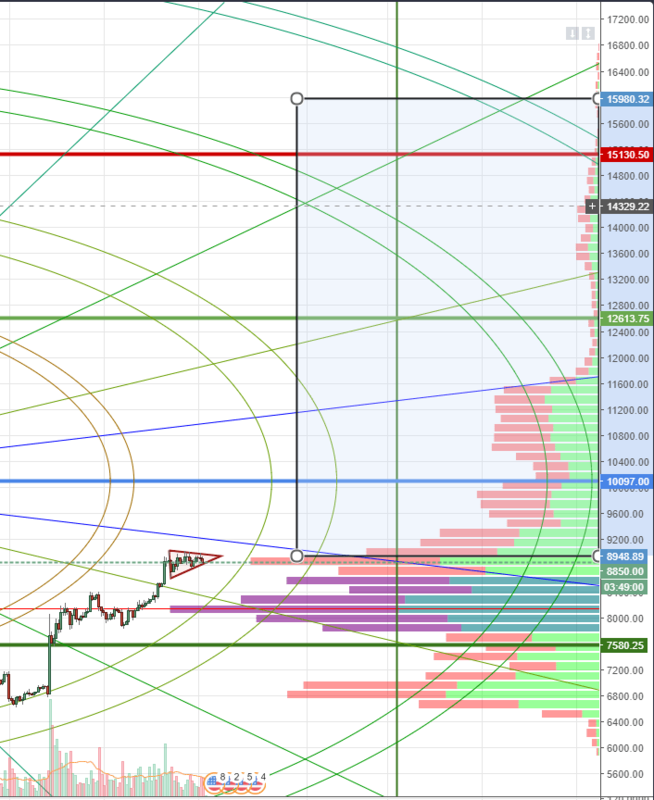 Bitcoin continues to consolidate around the $9000 value area. This a very bullish sign, especially when we consider that the weekends are generally a volatile time and that the price level was bought up whenever there was a significant dip. This shape is a very common type of chart pattern, it’s existed as long as price charts have existed. The behavior of a pennant is one of distribution (profit taking) and accumulation (hodling to distribute later). 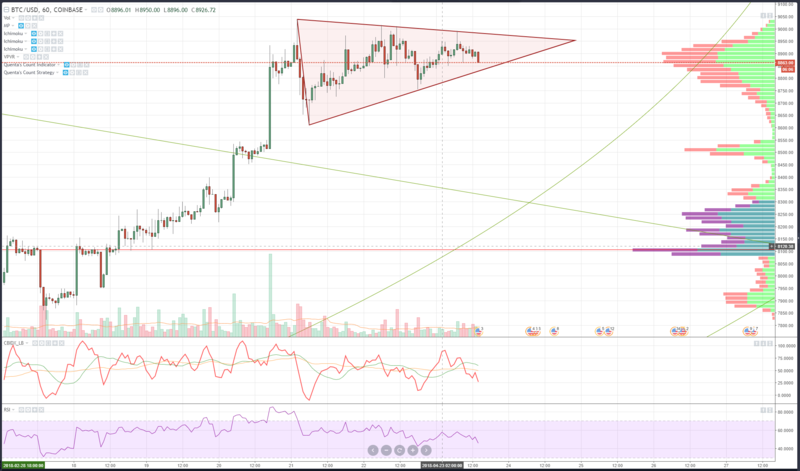 The strength of the pennant as a bullish pattern has to do with the slow rise in higher lows. This kind of strength is exacerbated especially if the value area is near an important historical level and/or psychological level. But there is one more piece of analysis that should be looked at that can certainly turn this recent drive up into a literal moon launch. VAP (Volume At Price) Analysis shows us how much volume has been traded at a certain price. Vertical volume bars are something most people are familiar with: they show how much volume was traded during a particular time. What is very telling about VAP is it can act as a support or resistance levels. But it can also tell us how much support or resistance can be expected. Looking at the above chart, we can see that as prices move higher, the volume participation decreases. What this means is that price has a much easier time moving higher than lower. The current behavior of Bitcoin ever since the beginning of the month is to create a ‘stair step’ up: small spike higher followed by some basing and consolidation, then repeat. Take Special Notice of the $11,600 value area: There is almost no volume traded at these price levels, which means that price can get sucked up like a vacuum to these levels. Fantastic analysis, as always! Love your style. But I have a hard time understanding where does the VAP info come from. Is it historical data? Or it looks at the order books? I can’t see how it could be very reliable in either case. Can you please expand on this a bit?